This Week's Dose: Back-to-Back Big Visit Weekends, Offers Never Stop, and OT. Bolingbrook (Ill.) linebacker Tuf BorlandWith a name that seems to indicate he's destined for the linebacker position, Tuf Borland is one of the top 2016 linebackers in Illinois. He holds an offer from Illinois, and is in regular contact with several dozen other schools. This will be the 6-1, 215-pounder's first visit to Michigan. Wyandotte (Mich.) Roosevelt wide receiver Donnie CorleyCorley is a 6-2, 170-pounder still looking for his first scholarship offer. He has good size, but more importantly the speed and ball skills to test a defense deep. He starts in the defensive secondary as well as on offense for his high school team. Cleveland (Ohio) St. Ignatius offensive lineman Liam Eichenberg - likelyA 6-4, 265-pounder, Eichenberg already holds an offer from Ohio State - his only at this point in the process. He comes from one of Ohio's top high school programs (which produced the likes of U-M linebacker jake Ryan in recent years), and should have plenty of opportunity to show his stuff on the national stage going forward. He currently projects to guard, but could grow into a tackle in due time. Saginaw (Mich.) Arthur Hill defensive end Lawrence GordonGordon was in attendance at last night's HYPE Showcase, but did not participate in the 7-on-7. The 6-5, 240-pounder has visited Ann Arbor multiple times, including for last summer's 2016 Barbecue at the Big House. Muskegon (Mich.) offensive lineman Juanye JohnsonA 6-4, 275-pound right tackle for his high school team, Johnson is still young enough that he could grow into the tackle position in college or stay about the same height and become a guard down the road. Either way, he's one of the state's top 2016 offensive linemen, and one with plenty of potential. This will be his first visit to Michigan. Harper Woods (Mich.) Chandler Park Academy wide receiver Jalen MartinMartin is a big-bodied 6-3, 190-pounder who excels on the football field and the hardwood for Chandler Park Academy. He's been a teammate of freshman Wolverines (Derrick Walton Jr. in basketball and wide receiver Csont'e York in both) in each. He already holds an Eastern Michigan offer, and should see many more down the road. Cincinnati Hills Christian Academy defensive/offensive lineman Prince Michael-SammonsA 6-6, 260-pounder, Sammons has the frame to play either defensive end or offensive tackle, depending on how he fills out. He's new to the game after moving to the United States from Nigeria, and he didn't play as a freshman while waiting for his eligibility situation from the international move to be sorted out. Mount Pleasant (Mich.) wide receiver Kalebb PerryPerry put together a strong sophomore season at Mount Pleasant High School despite being limited by injuries. He's a 6-2, 165-pounder with speed and leaping ability that allow him to serve as a deep threat whether it's through running by the defense or over them to make a catch. Farmington (Mich.) linebacker David ReeseThe 6-1, 235-pound Reese plays linebacker for his high school team, but could even play defensive end in college if he continues to grow. He visited Ann Arbor this fall for a football game, and has made the rounds at the in-state programs. His father played at Michigan State, so the Spartans were a sentimental favorite growing up. Midland (Mich.) Dow tight end/wide receiver Mike RobbRobb is a towering high school wide receiver at 6-6, 190, but it's likely he'll pack on weight and move to the tight end position as his body continues to develop. He has good speed - timed in the 4.7-second range in the 40-yard dash - and ball skills, and should become a legit BCS prospect in due time. Naperville (Ill.) Central wide receiver/defensive back Emmanuel RugambaA 6-0, 170-pounder, Rugamba played both ways for his high school team this fall and hasn't determined which he feels is his best long-term fit. This will be his first unofficial visit to Ann Arbor. Hartland (Mich.) tight end Nathan SkeneThe son of former U-M offensive lineman Doug Skene, Nathan doesn't quite have the wide frame of his All-Big Ten dad. However, thanding 6-5 and 190 pounds as a sophomore, he should continue to fill out and develop the body of a Big Ten-caliber tight end. He has visited Ann Arbor several times, including for the 2016 BArbecue at the Big House in July. Delaware (Ohio) Hayes outside linebacker Ethan TuckyAlready standing 6-3, 215 pounds, Tucky has a long, lean frame ideal for growing into the outside linebacker position at the next level. He holds an early offer from Eastern Michigan, and has taken unofficial visits to Ohio State, Notre Dame, and others. Detroit East English Village Prep offensive lineman Emani MasonMason is likely to be one of the state's top prospects in the 2017 class, and already stands 6-4, 265 pounds even though he's just a freshman. He started at left tackle for a program that sent Khalid Hill to Michigan in the 2013 class, and also produced the likes of Brandon Graham in past years (in a previous incarnation as Crockett High). Mason visited multiple times this fall. Miamisburg (Ohio) offensive lineman Josh MyersMyers already holds offers from Illinois and Indiana, and stands 6-5, 260 as a freshman in high school. This will be his first visit to Ann Arbor, and he also has trips planned to Tennessee and others this offseason. His older brother Zach plays on the offensive line at Kentucky. Saginaw (Mich.) Arthur Hill defensive end/tight end Will RogersA 6-6, 235-pounder, Rogers was one member of a physically imposing defensive front for Arthur Hill, while also contributing a bit on the offensive side of the ball. He's still a young player, so his body should develop in time. Orchard Lake (Mich.) St. Mary's linebacker Joshua RossRoss is the younger brother of U-M junior standout linebacker James Ross. The younger brother is already taller, at just over 6-1, but will have to dedicate himself in the weight room to get as massive as James was in high school. Either way, he has similar instincts and athleticism. Ross already holds offers from Michigan State and Oklahoma. My bro @Tkinnel_2 and I are about to show @mikeweber25 why Michigan is the right choice this weekend! Shawn Crawford also earned an invitation to the coveted summer camp "The Opening." 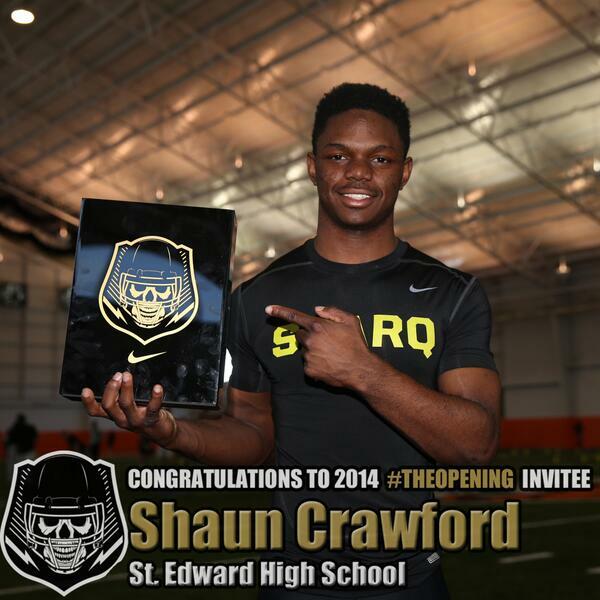 Crawford was arguably the best performer at the "Nike Football Sparq Combine:"
Congrats to Mr. Crawford on the invite. Seems as though, ever since Nussmeier took over as Offensive Coordinator, offers are flying out faster than you can say WOW!. These last couple week's saw no signs of slowing down the offer train. Kids from across the country are hearing from the coaching staff, receiving the best news possible -- a full ride to Michigan. '15 S Prentice McKinney, Jr. - Jr. Highlights - Reaction via MGoBlog's Brandon Brown: "I really like it. Michigan is high on academics and that's what I'm about. Great football, too." '17 OL Josh Myers - first offer of the 2017 class. Hoke and co. received another walk-on commit LB Alex Kaminski. Michigan makes the cut for two offeree's in the '15 class. LB Justin Hilliard has Michigan in his top 15; WR Juvall Mollette has Michigan in his top 10.